Occupy SLC • Protesters call police after attempts to end pre-dawn fight fail. Chris Detrick | Tribune file photo Tents at the Occupy SLC camp at Pioneer Park. 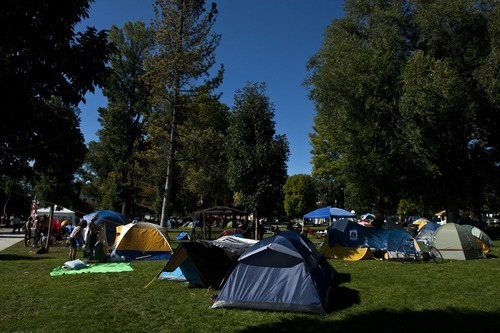 A small riot broke out in Pioneer Park early Thursday, prompting Occupy SLC campers to call police. A small riot broke out in Pioneer Park in Thursday's pre-dawn hours, causing Occupy SLC campers to call police after attempts to defuse the melee failed. The Salt Lake City Police Department said officers responded at 3:27 a.m. to a fight involving as many as 30 people. A 43-year-old man who said he was in charge of crowd control for the protest claimed that Jesse Jaramillo, 31, hit him on the head with a board during the fight. Jaramillo was arrested for aggravated assault along with several others arrested for public intoxication and alcohol violations, the police said. He was among four people booked into jail, the statement said. "That was kind of my alarm clock," said Seth Neily, 31, a spokesman for the Occupy SLC movement and a part-time worker for the local International Alliance of Theatrical Stage Employees union. "I think it was just a random person walking through who might have been inebriated," Neily said. "Most of these instances come from people not involved with the movement." Organizers of the protest camp in Pioneer Park have prohibited drugs, alcohol and violence. The protest began five weeks ago, and Neily said his commitment to continue camping there remains firm. "Some say this has turned into a movement for the homeless  but they are part of the 99 percent as well," Neily said. "They're the bottom end of the result of corporate greed." Meanwhile, the group is winterizing its camp and hopes to raise $1,100 to build a 900-square-foot structure to serve as an enclosed kitchen and storage area. About 70 tents are pitched on the park's southwest quadrant, averaging 100 to 140 residents depending on the day. The camp kitchen fed 85 people Wednesday. A few blocks northeast, the "Occupy the Fed" contingency is setting up camp at the Gallivan Center, a downtown site near 200 South between Main and State streets, offered by city officials after a private property owner asked police to clear protesters off his vacant lot at 147 S. State St.
"We're not serving food at this site, nor are we providing spare tents for anyone," said protester Seth Walker, a 27-year-old poet who helped organize the "Occupy the Fed" effort. The tech-savvy protesters recently received the donation of a wireless "hotspot," Walker said, along with five heavy-duty tents that can each sleep eight to 10 people. The group is assembling weatherproof platforms made out of vinyl-wrapped pallets to be used for off-ground sleeping. "We're mostly out there being a front for information," Walker said, "but also are providing an alcohol- and drug-free zone for people who want to come out with their families and show solidarity with us. "We're going to keep on moving this thing forward," he added. 11 a.m. • The Federal Reserve Bank at 120 S. State St.